The MEMCOR® CP II System from Evoqua Water Technologies is a pressurized, pre-engineered membrane system with a modular building-block configuration and ultra-compact footprint. The MEMCOR CP II system builds on 25 years of experience in supplying membranes and membrane systems. The system utilizes the latest enhanced PVDF UF membrane technology, and features design enhancements which reduce installation costs, improve system performance, and simplify operations. MEMCOR CP II is ideal for new installations and upgrades of existing facilities. It combines durable materials and reusable housings with easy module access that reduces maintenance requirements and delivers exceptional value over the entire system lifecycle. 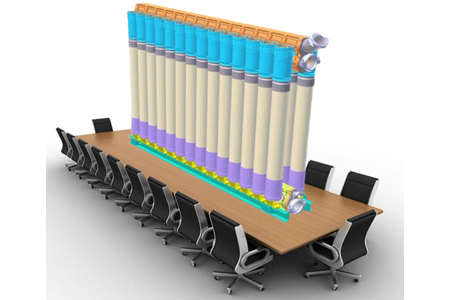 The MEMCOR CPII System can deliver 700,000 GPD in 25ft2 of footprint which is about the size of a conference room table.